What is now Huron County includes parts of the traditional territories of multiple Anishinaabe communities. Liz Duern is a current University Student, and worked as a Museum Assistant at the Huron County Museum & Historic Gaol during the summer of 2017. In this guest blog post for Treaties Recognition Week, Liz shares what she learned during her initial research into the treaty history of this area. What is a Treaty? How were they created? Treaties are agreements between First Nations and the British Crown. While the Crown used treaties to gain access to land for settlement and mining, First Nations understood treaties as building nation-to-nation relationships and protecting their continued stewardship of the land. The Crown often promised to protect First Nations’ rights and to set aside tracts of land for the exclusive use of the First Nations and their members. Today, the elders of many indigenous communities hold a great amount of knowledge regarding the intent of the treaties passed down through oral history. 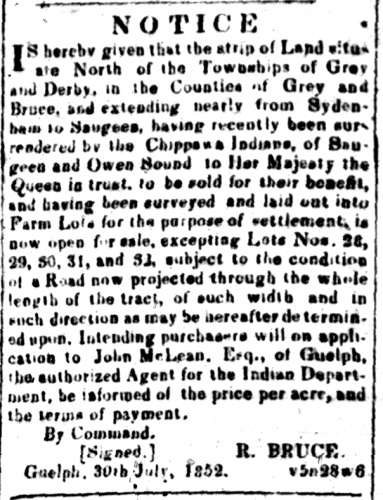 The Huron Tract Treaty was signed by eighteen Anishinaabek chiefs in 1827 in Amherstburg; the area included most of what is now known as Huron County, and parts of Perth & Middlesex. 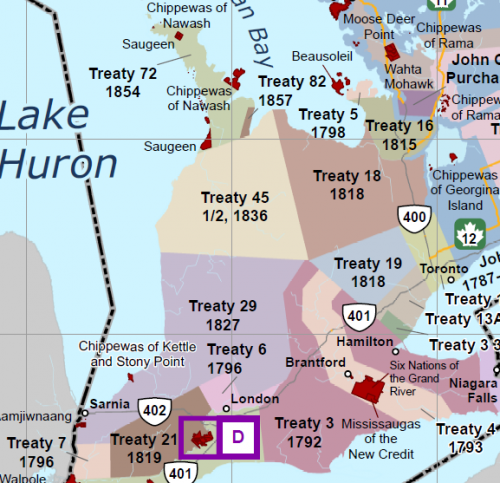 This treaty ceded 99% of the communities’ remaining lands to the British Crown, and designated four reserves: one along the south of St. Clair Township, one at Sarnia, and two on Lake Huron (Kettle and Stony Point). 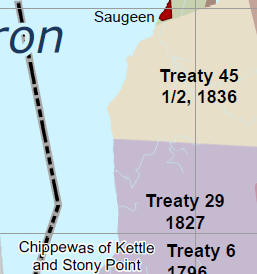 Treaty 45 ½, signed on August 9, 1836, dealt with part of the Saugeen Ojibway Nation’s traditional territory. The British promised the Saugeen Ojibway Nation that they would protect the Indigenous peoples who resided on the Saugeen Peninsula and that the Saugeen Peninsula would be protected for their use. Not long after this, the British claimed that the Saugeen Peninsula could not be protected against settlers unless another treaty was negotiated. This treaty was Treaty 72, which ceded about 500,000 acres of the Saugeen Peninsula to the British Crown. Treaties are not just historical documents, but outline ongoing rights and responsibilities that are protected by the Constitution Act, 1982. These rights and the spirit of the original agreements have often been violated “by colonial policies designed to exploit, assimilate and eradicate” First Nations communities and their cultures. Access teaching resources to better understand what it means to live on Treaty Land.